Dr. Jonathan Hart Moderates the Liberia Ministry of Education Science Bowl Competition in Monrovia, Liberia. Hunter College High School Students: President of the I-HELP Liberia Club Alison Zhao, Michelle Chan, Amy Pan, and Edward Zhou. One year ago, the World Health Organization declared the West African Ebola outbreak a public health emergency of international concern; in Liberia alone the death toll exceeded 4,000. Extreme poverty, a dysfunctional health care system, and local burial rituals all contributed to the failure to control the epidemic. Though Liberia has been largely Ebola-free, the epidemic decimated Liberian families, social structure and economy. In the epicenter of the Ebola disaster and its suffering, Dr. Jonathan Hart was one of the many heroes who did all he could to minimize the casualties. Behind Dr. Hart’s active stance and determination in the Ebola crisis were two American scientists sponsored and counseled him through medical school. Dr. Hart, who has been issued his license to practice medicine in Liberia, operated an Ebola clinic in his region, citing his success as a product of the two scientists’ help. Dr. Adam Cohen and Dr. Benjamin Rapoport, the two scientists who had such a profound impact on Dr. Jonathan Hart’s life, have established and sustained immensely helpful connections to Liberia, nurturing science education and bettering the lives of many. Drs. Cohen and Rapoport now bestow their eponymous scholarship upon three Liberian medical students: Gassimu Kaba, Forkpa Kemenzee, and Mahmoud Dukuly. The two scientists have pledged their dedication to help these students accomplish their goals of being medical practitioners in Liberia. In addition to monthly stipends, Drs. Cohen and Rapoport plan to organize quarterly meetings with these students to discuss their education and counsel them. In order to enrich these students’ training, the two scientists are working on acquiring medical textbooks and electronic resources for them. Dr. Cohen is a tenured professor of chemistry, chemical biology and physics at Harvard University. He is the recipient of the Blavatnik National Award for Young Scientists and the Presidential Early Career Award for Scientists and Engineers and has been selected by the MIT Technology Review to the TR35 as one of the top 35 innovators in the world under the age of 35. He is also co-founder of Q-State Biosciences, a company that has developed an all-optical electrophysiology platform for controlling and recording activity in electrically active cells. Dr. Rapoport holds a dual doctorate and is on the neurosurgery team at Weill Cornell Medical Center. He is the recipient of the Martha Gray Research Award for Biomedical Devices as well as a Medical Engineering Fellowship from the Massachusetts Institute of Technology & Center for Integration of Medicine and Innovative Technology. Both scientists conducted an intensive science training program at the University of Liberia in 2010 and have formed enduring links to Liberia. Both are also alumni of Hunter College High School, where they were mentored by Mr. Asumana Jabateh Randolph, a citizen of Liberia. Mr. Randolph is also the program director of the I-HELP Liberia Project. Mr. Randolph, ever fond of his alumni, is supremely proud and appreciative of all his students, many of whom have achieved phenomenal success like that of Drs. Cohen and Rapoport. Indeed, the duo credits much of their eminence to Mr. Randolph. The work that these two scientists have done is just one example of the fantastic reach of the I-HELP Liberia Project. The organization’s focus for this past summer was holding the first-ever Liberia Ministry of Education Science Bowl competitions, which were held in Monrovia and Ganta. In its efforts to support the Liberian science, technology, engineering, and math (STEM) program, the project donated 10 mobile labs to 10 schools. The project will return to Liberia in December 2015 to facilitate another science competition and make more donations. If the Cohen & Rapoport Scholarship continues to be as fruitful as it was in the case of Dr. Jonathan Hart, it will continue to provide aid and guidance to Liberian medical students and produce the future leaders of the Liberian medical field. The impetus is clear- Drs. Cohen and Rapoport are giving back to Liberia what Liberia has given to them. Thanks so much to I-HELP. Liberia appreciates you!!!! Mr. Randolph, it was really great meeting you and your students. 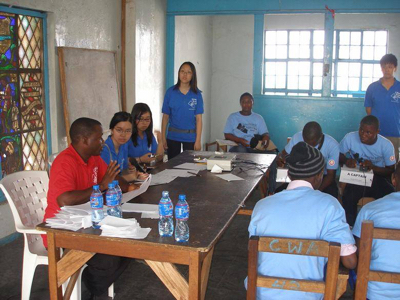 The Ministry of Education and the entire country of Liberia extends thanks and appreciation to I-HELP!! Thanks for your kind words! It was a pleasure for our team to meet you as well. Copyright I-HELP Liberia Project Incorporated.